A picnic is incomplete without food, and picnic food is incomplete without sandwiches. This is because sandwiches are tasty, handy to serve, filling and loved by everyone. Sandwiches are also versatile. There’s a lot of variety to choose from. You can make plain, toasted or grilled sandwiches, loaded with your favourite ingredients! That’s not all – sandwiches are also easy to prepare, which makes it convenient to prepare a lot of sandwiches before leaving for your picnic without sweating in the kitchen till the last minute. Everybody loves to help out with making the sandwiches too, because it’s fun to spread the butter and load your favourite ingredients into it. So, you are sure to have a few helping hands! However, there are some questions that riddle everyone’s mind when they set out making the sandwiches for a picnic. There is always an inkling of doubt about whether you are using the right ingredients, whether you are cooking and packing the sandwiches properly, and whether they will last for a long time without spoiling or getting soggy. This mailer will set your doubts to rest. 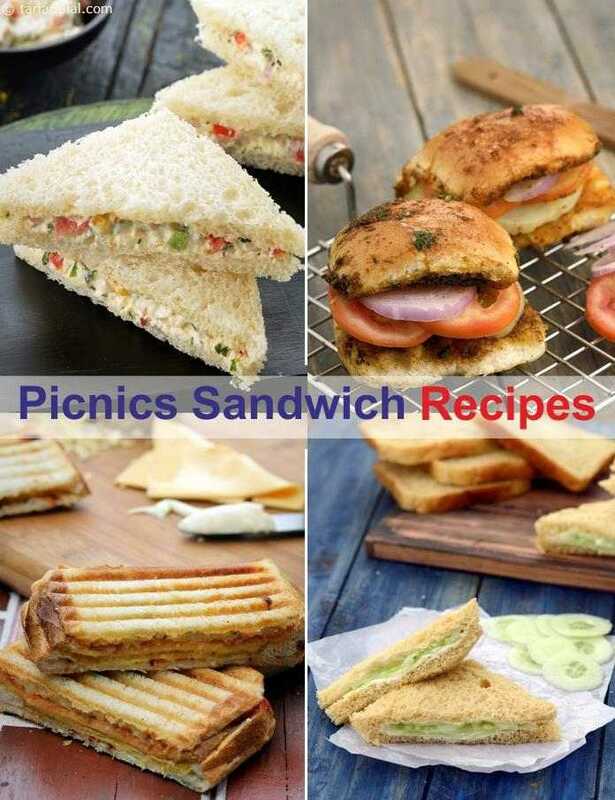 Apart from giving you some awesome sandwich recipes that will last from morning to evening, we also share some general guidelines that will help you make your own picnic sandwiches too. Always remember that sandwiches that are cooked in a griller or tava have to be cooled completely before packing. Else, they will ‘sweat’ and become soggy. Always pack each sandwich individually in aluminium foil paper. This is especially important for cooked sandwiches, because they will tend to stick together. So, if you are carrying four grilled sandwiches, pack them in four individual foil packs. If you want to do it the eco-friendly way, you can even wrap it in fresh banana leaves! Then, place all the packed sandwiches neatly in an airtight container and close tightly. This will prevent them from getting crushed or damaged in any way. Never make the sandwiches the previous night itself and keep them in the fridge. They will spoil faster! Spare a little time and prepare the sandwiches in the morning. Get someone’s help if you need to do it faster, but do not try making the previous night. Try to avoid putting mayo or plain tomatoes in your sandwiches, as they tend to get soggy. Make sure the Green Chutney, if you are using some, is thick and not watery. Instead of putting your ketchup or mayonnaise in the sandwich, carry it separately in sachets or in small containers and drizzle some over your sandwiches before serving. Always use only freshly bought bread to make your picnic sandwiches, so that they will be firm and last longer too. If you wish, you can trim the edges of the sandwiches to make them softer. But, if you want them firm, keep the edges on. Sandwiches are truly limitless. You can make any number of varieties by mixing and matching different ingredients. This mailer introduces you to some all-time favourites like the Potato Sandwich, Chutney Sandwich, Cream Cheese Sandwich and Cucumber Cheese Sandwich, as well as novel delights like the Pav Sandwich, Bread Pizza and Potato and Corn Sandwich On A Tawa. We have picked recipes that you can confidently pack for a picnic – they are sure to remain tasty and good for a long time!